There’s still a full day of first round matches – 24 to be exact today. We’ve also got our first second round matches after some opening action yesterday that progresses today. The predictions for other first round matches can be seen here. Florida looked as good as they have all season in dominating Florida State in the first round while FGCU scored the upset of the tournament so far in winning 3-2 at 13th-seeded UCF. It’s already their best season ever, but can they do what their basketball team did a few years back in making the Sweet 16? We predict not as the Gators block should take charge. Pepperdine pulled off a first round upset of Northern Iowa behind a solid serve. They’ll need that again in this one. They should keep things competitive, but Wisconsin playing at home will have too much firepower and go to another Sweet 16. The Longhorns dominated a two-loss Stephen F. Austin team in the opening round and will once again have enough offensive options to get past Texas State. At the very least though, Texas State has some talent and are led by Florida transfer Cheyenne Huskey to keep things close. Both of these teams are looking to break into the Sweet 16 after second round exits in 2017. 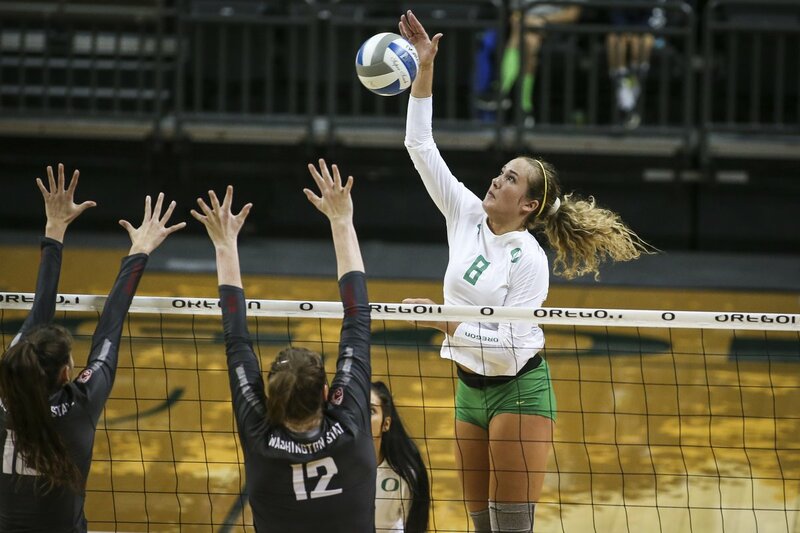 Taylor Borup was hurt in the last match and her status is uncertain for Oregon, but they’ve still got depth which could be enough in a pretty even match with some high-level attackers.